Fathom Events brought Doctor Who: The Power of the Daleks to theaters Monday night before it was released to the world for home viewing. 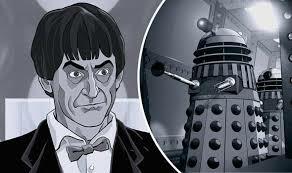 Using original audio from 50 years ago, Power of the Daleks was animated to allow for the story to be shared in spite of the loss of the live-action video. The dreaded villains of the Doctor Who universe try to take control of a remote human colony; to do so, they take advantage of a power-hungry official and a foresight-lacking scientist. Only the Doctor can see the threat that the Daleks pose, and he must work to stop them from exterminating human life from the colony. There is no adoption connection here, but kids might enjoy getting to know Doctor Who, who has taken a special interest in the human race and serves as a brave and creative protector. The Power of the Daleks is an engaging story, although the animation style was a bit choppy, and teens might find the current series of Doctor Who more interesting than the vintage series.